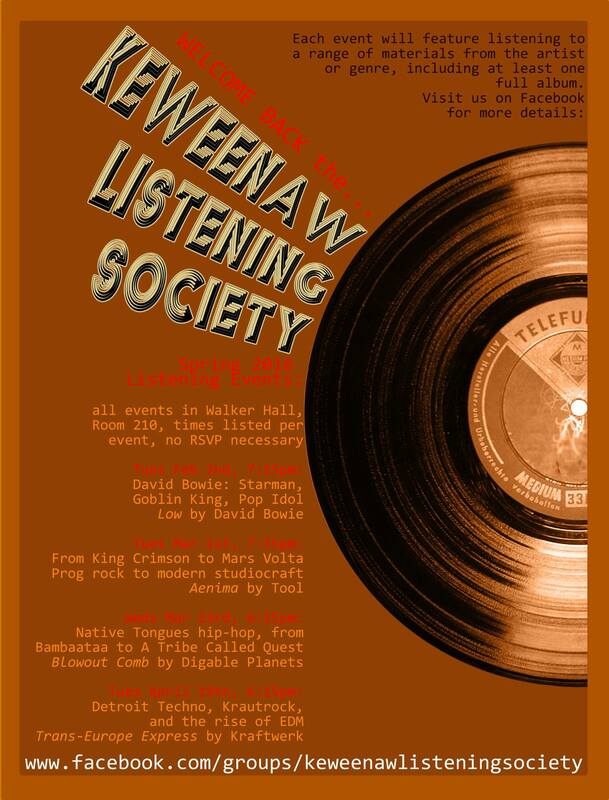 Keweenaw Listening Society is a semi-regular gathering centered around listening to and discussing some of the most interesting and important albums ever recorded. All Michigan Tech/VPA students, faculty, staff and their friends, families and their snacks are welcome to join us. Attendance is free, no RSVP needed. Our next event is at 7:15 p.m. tomorrow (March 1, 2016) in Walker 210. We will be listening to legendary prog and hard rockers starting in the 70’s and progressing through to today. We will listen to the entirety of Tool’s “Aenima” and discuss its innovative production techniques. Also join us at 6:15 p.m. Wednesday, March 23 in Walker 210 for an evening focused on Native Tongues Hip-hop and its evolution into backpack rap and other genres. We will listen to Digable Planets’ “Blowout Comb” in its entirety. Finally this semester, join us at 6:15 p.m. Tuesday, April 19 in Walker 210 for Detroit Techno, Krautrock and the Birth of EDM, where we will listen to Kraftwerk’s “Trans-Europe Express” in its entirety. Events typically last between two-and-a-half and three-and-a-half hours and always include a range of listening and discussion, including at least one full album. All are welcome to attend (though keep in mind, not all material presented will be suitable for young children — these are typically events featuring adult content). If you can only attend part of the time slot, you are still welcome to join us when you are able. More information can be found on Facebook. From Tech Today, by Josh Loar, VPA. 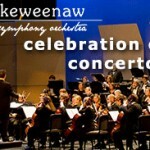 The Rozsa Center is pleased to welcome the Keweenaw Symphony Orchestra in their Celebration of Concertos at 7:30 p.m. Saturday, February 27, 2016. The eight talented winners of the KSO Concerto Competition join the Keweenaw Symphony Orchestra in an exciting evening of concertos by Prokofiev, Strauss, Mendelssohn, Offenbach, Puccini, Saint-Saens, Massenet, Kabalevsky and Mozart. Tickets are on sale now, $19 for adults, $6 for youth, and no charge for Michigan Tech students with the Experience Tech fee. Tickets are available by phone at (906) 487-2073, online, in person at the Central Ticketing Office in the Student Development Complex or at the Rozsa Box Office the evening of the performance. Please note the Rozsa Box Office only opens two hours prior to performances. From Tech Today, by Bethany Jones. There will be an Arts and Ecology Lecture by Artist-Scholar Rachel Kauff titled “Past Use: Ecology and Art Objects” at 4 p.m. tomorrow, February 19 in Dow 641. Kauff, Visiting Women and Minority Scholar, will give a free public lecture linking her artist practice and her ideas on ecology. 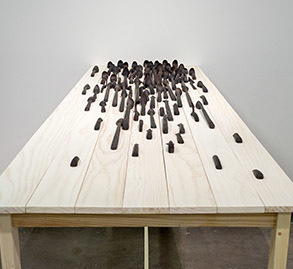 “Past Use” will cover the artist’s trajectory of ecological art making and will include recent works that are inspired by American hand tools to describe the landscape and human relationships to the environment. From Tech Today, by Lisa Johnson, VPA. These performances are by conScience: Michigan Tech Chamber Singers, directed by Jared Anderson. 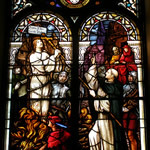 They were recorded at St. Joseph Catholic Church in Lake Linden, MI, in March 2015. Did you know that “Geodesy” is the science of measuring the earth in all of the ways that it is possible to do so? There is music that speaks to that study, to the sheer power of the outdoors, the world we live in. 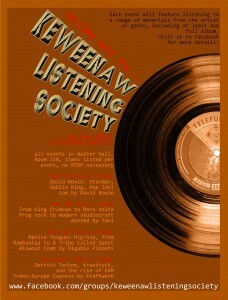 As the wind and snow howl outside, take a step back and spend an evening celebrating the music that power inspires. 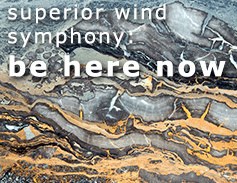 Please join Superior Wind Symphony’s 45 musicians inside the warm Rozsa theatre for a concert about the beauty, the science, and the expanse of the outdoors in their concert “Be Here Now” at 7:30 p.m. Saturday, February 20 at the Rozsa Center for the Performing Arts. Based on more than 50,000 student rating of instruction responses, 11 finalists have been identified for the 2016 awards. The selection committee is soliciting comments from students, staff, faculty and alumni to aid in its deliberation process. Among the finalists in the Associate Professor / Professor Category is Associate Professor Joel Neves. Comments on the nominees are due by Friday, March 18, 2016, and can be completed online. From Tech Today, by by Jackson Center For Teaching and Learning. Among the finalists in the Assistant Professor / Lecturer / Professor of Practice Category is Assistant Professor Lisa Johnson de Gordillo. Michigan Tech’s Rozsa Center, the Department of Visual and Performing Arts and the Department of Biological Sciences are excited to present a lecture and exhibition exploring the connections between art and ecology, by visiting artist Rachel Kauff. Kauff will first present a lecture, Past Use: Ecology and Art Objects, at 4 p.m. Friday, February 19 in DOW 641. A-Space, the Rozsa Professional Gallery, will feature Kauff’s work in an exhibition titled “Tipping Points,” February 20 – April 25. There will be an opening reception and gallery discussion in A-Space for “Tipping Points,” from 5 to 7 p.m. Saturday, February 20. This event is partially sponsored/funded by the Visiting Women and Minority Lecturer/Scholar Series (VWMLS) which is funded by a grant to Institutional Equity & Inclusion from the State of Michigan’s King-Chavez-Parks Initiative. What’s a great idea for a night out with your valentine? 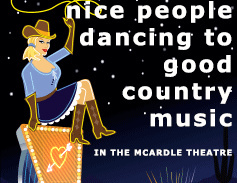 Join Tech Theatre as they present “Nice People Dancing to Good Country Music” in the McArdle Theatre on Thursday, February 18 – Saturday, Feb. 20 and Thursday Feb. 25 – Saturday Feb. 27. Show time is 7:30 p.m. each night. “Nice People Dancing to Good Country Music” is a play by Lee Blessing. A fun, romantic comedy, featuring a country bar-owner, a nun with a funny way of shouting out obscenities at the wrong moment, her aunt and the hilarious, unlikely romance that unfolds. Learn more about the show and get ticket information online.